I’ll cut right to the chase here: this film is AMAZING. I would go as far as to say that it’s one of the funniest films I’ve seen in my lifetime. 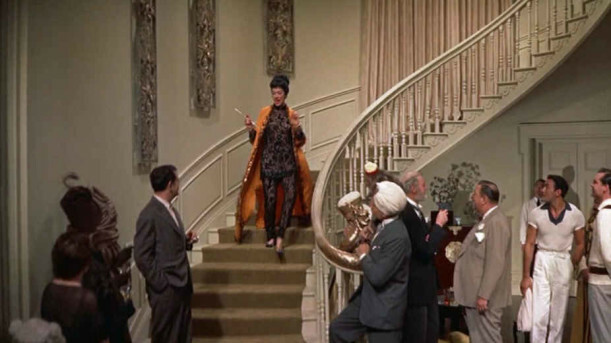 Rosalind Russell stars as the ultra-eccentric Auntie Mame, who takes in her nephew Patrick and teaches him to “live, live, live!” The film covers quite a large chunk of their lives — Patrick moves in as an adolescent, and by the end of the film he’s married. This is definitely an over-the-top comedy. The dialogue and scenarios that the characters get themselves into lend themselves easily to hilarity, and the fantastic timing by Rosalind Russell and the rest of the cast take it even further. The film clocks in at nearly two and a half hours, but it never drags. I have absolutely no complaints about this one. * It’s completely unforgettable, and 100% enjoyable. “Life’s a banquet, and most poor suckers are starving to death,” as Mame says — but viewers certainly won’t be starving for entertainment after watching this delightful, fantastic comedy. *which is why this review is so brief. I really don’t have much to say except that I loved, loved, LOVED this film. Do yourself a favor and watch it as soon as possible! Interested in watching this film? Buy or stream it using the links below to make a small donation to TMP!